This is the third and final part of our troubleshooting assistance for Samsung Galaxy S5 hardware issues. In this guide, we are going to discuss three more screen problems including cracked screen, bleeding screen and unresponsive screen. Read on to know your options if you have any of the aforesaid screen problems/damages. If your device's touchscreen or LCD is cracked, you may still be able to use it but viewing what is on the screen would be your problem. 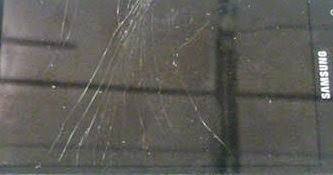 Sample image of a cracked screen or LCD. Obviously, your device is damaged and your only option in this case is to have it repaired. If your phone is new and that you've got it from your service provider, please contact them, tell them what happened and then ask for your repair or possibly, replacement options. A bleeding screen is when your device seems to have ink or colored lines running across the screen but it is not cracked. Sample image of a bleeding screen or LCD. If this is what you're seeing in your device's screen, then it denotes a physical damage is present. And as what we've mentioned earlier, physical damage is not covered under Samsung's standard limited warranty. So the only option you have is to send your device for repair or contact your service provider if you get your phone from them. Let them know of your device issue and ask for your warranty options. You may be able to avail of a replacement but for some cost. If your device does not respond when you touch anywhere on the screen, try to make sure your hands are not wet, if so then let it dry first. Other possible reasons as to why your device won't respond to touches would include any a third-party application that's causing an issue, or an accessory like a case or screen protector is barring the screen from responding. Also, physical or liquid damage may also be the culprit. Try to remove any accessory including a case or screen protector from your device and then try to see if it fixes the problem. If not, then try to clean the screen using a dry cloth to remove any excess oils or dirt. Sometimes, a device won't be able to recognize your touch and therefore won't respond because of too much dirt or some oils on screen. Performing a soft reset is also recommended for problems like this. Just remove the battery for 30 seconds with the device still on, then re-insert the battery and power on the device. If problem persists, and that it occurs while using a certain app, then try to uninstall that application as it may likely be causing some conflicts. You can uninstall a recently installed application or downloaded widget that is causing an issue using the Task Manager application. To get started, open the Task manager app by touching and holding the Home key for one to two seconds and then touch on the icon. Next, touch the Downloaded tab and then scroll to the app yo want to uninstall. Touch the Uninstall button next to the app and then touch OK to confirm uninstall. Don't worry though because you can always download the app again from the Play Store if you found it isn't causing the problem. If the problem occurs just recently after you have downloaded or uninstalled an app or widget, you can directly view and uninstall them by going to the Menu, touching List by and the select Order of download. If you want to troubleshoot whether or not the recently added applications are causing the problem, then you can boot your device to Safe mode. Running the device is safe mode will only load the basic system software. If your phone properly responds to touches in safe mode, then it denotes the problem is caused by a recently added or installed app or widget. And to solve the problem, you need to uninstall that application. 1. Power off your device completely. 2. Press and hold the Power/Lock key to turn on the device. 3. Press and hold the Volume down key until you're prompted with the lock screen. When the lock screen appears, you should see Safe mode shown in the lower-left corner of the screen. Just restart your phone to boot into normal mode after you're done troubleshooting app problems in safe mode. If problem isn't fixed after performing every available workarounds and resolution procedures, then you may consider performing a hard reset or factory data reset. While the process is known to help fixed several problems on a device, doing so will also erase all your data or personal information. Knowing of this outcome, it would be wiser enough to create a backup of all your necessary information before you start doing a hard reset. 3. Touch Back up and reset. 4. Select Factory data reset. 5. Read and review the prompted information/message, then touch Reset device. 6. Finally, select Delete all. Wait for a few minutes for the process to finish and after that your phone restores the Android platform to its original state. If a factory data reset did not fix the problem, please contact your phone carrier to escalate your device problem and ask for available repair or replacement options you can avail. And that covers everything on our troubleshooting assistance for Display Issues with the GS5 handset. Please keep posted for our next contents that would cover more hardware issues with the Galaxy S5, along with the available solutions and manufacturer-recommended workarounds.